Have you ever tasted East Frisian tea? Drinking a cup of this tea is a wonderful experience, one that is best enjoyed in East Frisia. With a history that is now more than a century old, this tea ceremony is unique in the world and rarely practiced outside the region that originated it. In East Frisia there is an expression that says that a winter without snow is like a cup without tea. Let's find out what makes this tea so special! East Frisia (Ostfriesland) is a region in the northwest of Germany, right next to the Netherlands in the German state of Lower Saxony. Much like the Netherlands, East Frisia is a flat land with a multitude dikes, canals and green pastures. This coastal region is bathed by the North Sea, which allowed its people to have access to sea routes for the trading of goods from the Orient. This in turn made it possible for local merchants to flourish, some of which remain well-known today. East Frisia was greatly influenced culturally both by the Netherlands and England. This would lead East Frisians to begin to import and drink tea in great quantities. Additionally, they would drink their tea in their very unique way, a tradition that continued even as Germans in other parts of the country began to enjoy coffee. Today, drinking tea is still an important aspect of the East Frisian culture, so much so that if it were an independent country, it would have the highest annual consumption of tea per capita. However, as the rest of Germany seems to enjoy coffee better, the country as a whole does not rank among the top tea drinking countries in the world. What is East Frisian Tea? East Frisian tea is not a tea that is grown in the region of East Frisia, it refers to the local tea ritual that is enjoyed by East Frisian people and it is said that you can't enjoy it anywhere else. Let's find out why. First, the tea. East Frisian tea is essentially a tea blend made up of rich Assam black tea, about 90%, sourced from 2nd flush (the summer harvest). 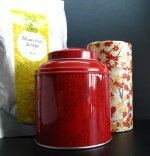 As this is considered the best tea for this blend, resulting in a red-golden infusion that it flavorful and aromatic. 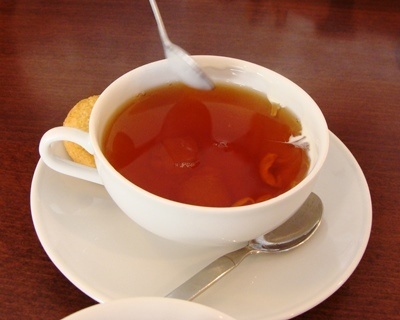 All grades of black tea are used, but preference is given to fannings. The remaining 10% of the blend is made up of a mixture of other lighter fruitier black teas, such as Darjeeling, Ceylon, Java, Sumatra, etc. Some say that there may be as many as 20 different components making up the final batch of East Frisian tea. Tea is brewed with water from this region, which is softer and sweeter than average. Soft water does not contain calcium and magnesium ions. The result is a brewed tea that is also sweeter and with complex flavors. This is the main reason why the flavor of this tea is so hard to replicate anywhere else in the world, as you can take everything else with you except the water. 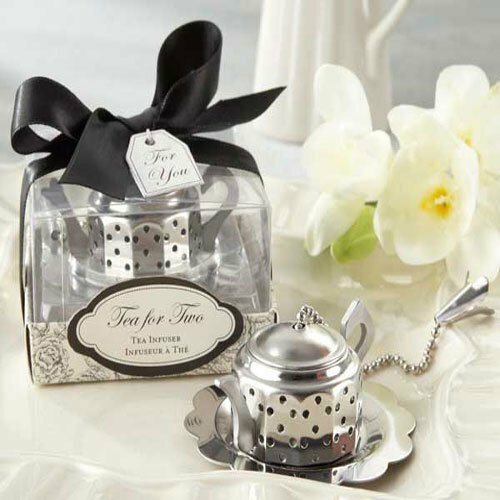 Tea is brewed in a kettle and then poured into a teapot that is kept warm as it is placed over a candle in a matching porcelain tea warmer. It is served in small thin porcelain cups that have the typical red rose patterns. The cups are so delicate and pretty and because they are small, they allow you to enjoy multiple cups of tea before you being to feel you are full. A mug or a regular 250ml tea cup will not do as the tea will not be served properly in the larger vessels. The tea drinking ceremony as we know it today dates back only to the 19th century. However, while the local Frisian language seems to be slowly disappearing, the rituals surrouding tea drinking in this region form part of the local cultural identity as much today as they did back then. Start by brewing a pot of East Frisian tea. Use near boiling water and then the tea should be left to steep for about 4 minutes. On a typical East Frisian tea table you will find a bowl of kluntje that you can take with a pair of tongs. A kluntje is a rock of sugar, much like a crystal the size of a very irregular sugar cube. The rock of sugar is placed in your empty cup of tea. As the tea is then poured over the sugar, the rock may crack, but it usually stay whole and just slowly melt with the heat of the tea. Once the cup is almost full, a bit of cream is added to the tea. Unlike other places where the milk is usually poured from a jug onto the center of the cup of tea, East Frisians have their own of doing this. 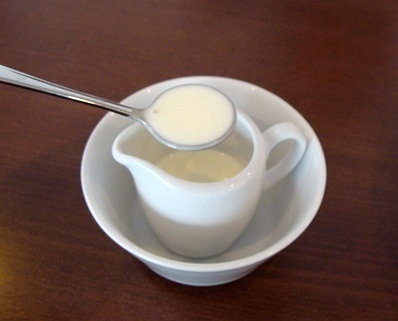 A tiny jug of cream is set out on the table with a spoon that is like a tiny laddle and can hold no more cream than a regular coffee spoon would (less than half a teaspoon). A spoonful of cream is gently laddled on to the tea cup, carefully brushing against the side of the cup in a circular motion. The idea is that the cream should travel to the center of the cup as is forming swirls of cream, like clouds, creating different patterns every time. There is as much to brewing tea in the East Frisian way as there is to drinking it in the local traditional way. Your tea has been poured over the rock of sugar and the cream expertly placed on the edge of the cup. What do you do now? 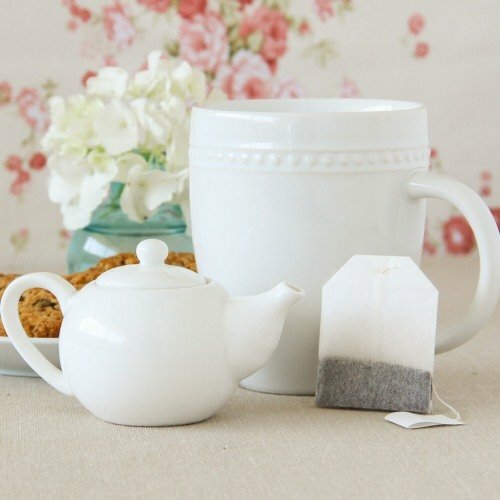 Your first urge may be to grab a teaspoon and stir your tea. Afterall on the table that has been properly set you will find a small dish with teaspoons for guests to use. Wait! 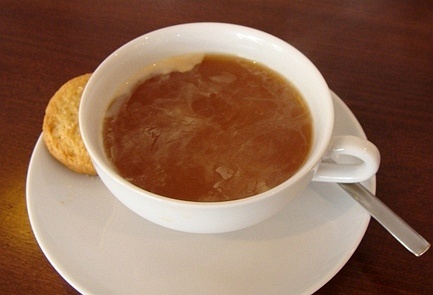 East Frisian tea has to remain unstirred, but nor should you drink it straight away. 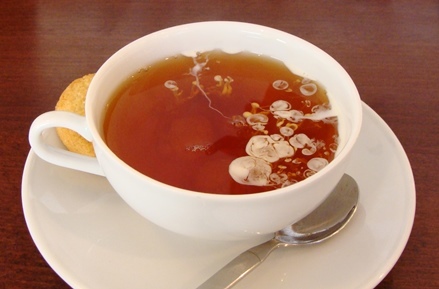 Once the cream has been added to the cup, if it is unstirred, you will notice that the cream will slowly spread through the tea forming clouds. And much like real clouds, no two tea clouds are the same so it is amazing to watch every time a fresh cup of tea is poured. Now take a sip of your tea. As you hold your cup to your mouth and tip it to drink, the tea, sugar and cream will begin to mix. At first you may only get a bit of the cream, then just tea, then both as they slowy blend together, it all depends on how the cream clouds form and spread. As you reach the bottom of your cup, the tea will get sweeter as it has blended with the rock of sugar. There is so much variety of flavor in one single cup that it feels like it is anything but a simple cup of tea with cream. 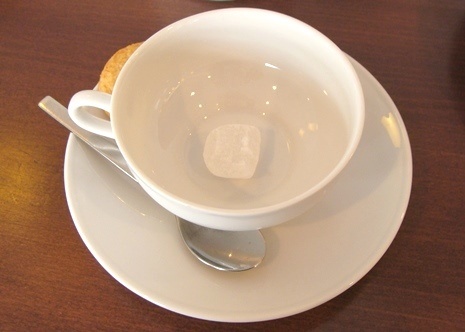 As the rock of sugar has not yet completely melted, you will be served a second cup of tea and more cream will be added. And with each cup the East Frisian tea drinking experience begins again. How many cups should you drink? 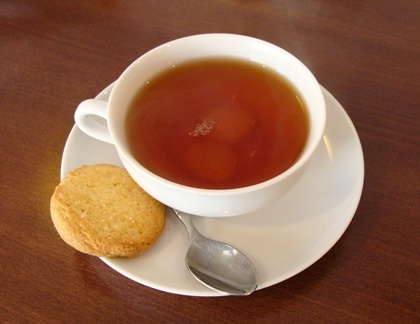 Traditionally, people will usually drink three or more cups of tea. A typical cup of tea in this region is smaller than the regular cup of tea (250ml) and so you can enjoy multiple cups of tea. The advantage of the smaller cups also seems to be that you can enjoy the process of making several cups of tea and have the pleasure of the evolving flavors more than once. Depending on the size of the rock of sugar you choose, it usually also takes about three cups to completely melt the sugar down before you need to place a fresh one in your cup. So what is the purpose of the teaspoon? When sitting down to a cup of East Frisian tea you will notice that the teaspoons are not distributed between the tea drinkers. Instead, they are all placed in a single dish on the table. If do not stir East Frisian tea, then what is the point of having teaspoons on the table anyway? Well, when you are done drinking your three or more cups of tea you take one of the spoons from the saucer and place it in your cup and this is how you signal to your host that you have had enough and you are done. If you wish to try East Frisian tea you can head over to Germany where you will find tea shops and even tea museums dedicated to this tea. In the town of Leer (an hour by train from Bremen), is the Bünting Tea Museum. 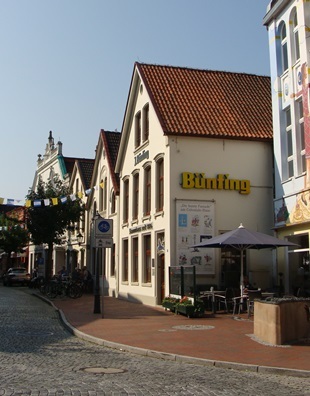 This is a tiny Museum dedicated to Bunting, a trader that helped to bring tea from Asia to East Frisia and today is the only brand that sells the East Frisian tea blend at a national blend. The displays are all in German, but tickets are fairly cheap and at the end you are treated to a cup of tea and cake served in the traditional way. In the shop you can also purchase the tea, cups and kluntjes, and every Tuesday there are hour-long tea workshops. Right next to the museum is a tea shop where you can sit in the tea room part and enjoy a cup of this and other teas and try a variety of sweet and savory treats. On the shop side vast selection of teas and sugars are sold, not just the East Frisian blend, and other local products and ceramics as well. In Norden, nearer to the North Sea coast is the East Frisian Tea Museum. 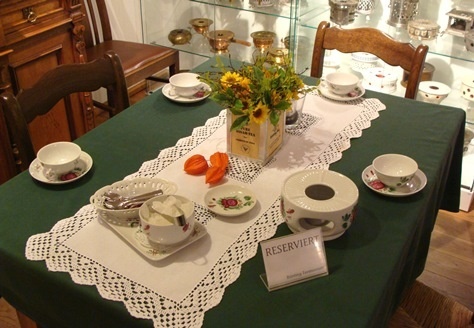 Again the museum is in German and you will be able to purchase tea blends from the most famous East Frisian tea brands and enjoy the collections of antique tea sets with the traditional design. Try East Frisian Tea today! Take part in this unique tradition and enjoy a great cup of tea!